Spay and Neuter Procedure Includes: Anesthesia and monitoring, surgical procedure, antibiotic injection and pain medications to go home. Low cost spay and neuter san diego are routine, affordable surgeries that can prevent thousands of animals from being born, only to suffer and struggle to survive on the streets, be abused by cruel or neglectful people, or be euthanized in animal shelters for lack of a loving home. Low cost spay and neuter san diego makes a big difference: Just one unaltered female dog and her offspring can produce 67,000 puppies in only six years. In seven years, one female cat and her offspring can produce an incredible 370,000 kittens! Sterilized animals live longer, happier lives. Low cost spay and neuter san diego eliminates the stress and discomfort that females endure during heat periods, eliminates the risk of uterine cancer, and greatly reduces the risk of mammary cancer. Neutering makes males far less likely to roam or fight, prevents testicular cancer, and reduces the risk of prostate cancer. Altered animals are less likely to contract deadly, contagious diseases, such as feline AIDS and feline leukemia, that are spread through bodily fluids. Communities spend millions of taxpayer dollars each year coping with problems that a failure to spay and neuter causes. 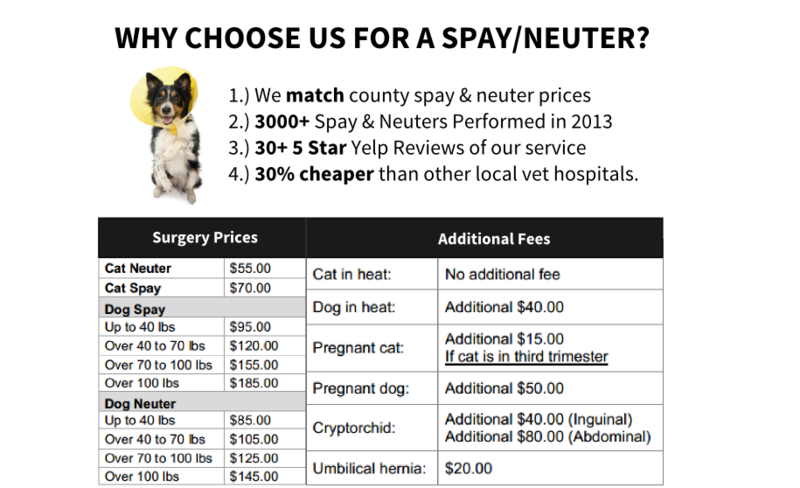 Low cost spay and neuter san diego eliminates the expense involved in rounding up strays, feeding and housing abandoned animals, and euthanizing those for whom homes can’t be found. Cities and counties all over the country are aggressively addressing the animal overpopulation crisis, requiring everyone who chooses not to spay or neuter to pay a hefty breeder’s fee. Areas with mandatory spay-and-neuter laws have reported a significant reduction in the number of animals who are taken to their facilities and subsequently euthanized. Many communities have low-cost or free spay-and-neuter clinics that make it easy for everyone to do the right thing and have their animals sterilized. Low cost spay and neuter san diego at Black Mt. Rd. Pet Clinic can help.